This new picture from the VLT Survey Telescope (VST) at ESO's Paranal Observatory shows the remarkable super star cluster Westerlund 1 (eso1034). 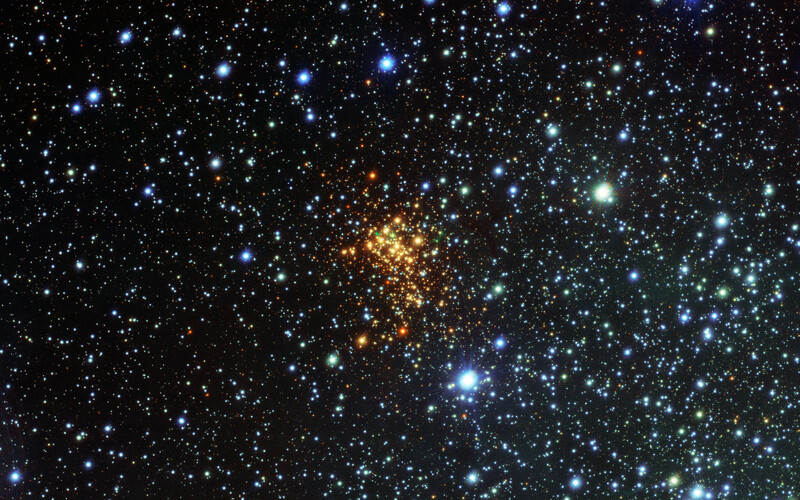 This exceptionally bright cluster lies about 16 000 light-years from Earth in the southern constellation of Ara (The Altar). 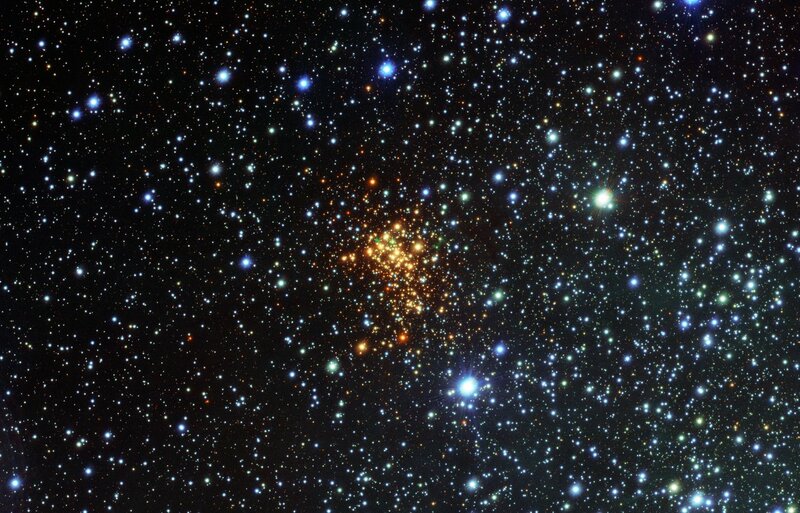 It contains hundreds of very massive and brilliant stars, all of which are just a few million years old — babies by stellar standards. But our view of this cluster is hampered by gas and dust that prevents most of the visible light from the cluster's stars from getting to Earth. 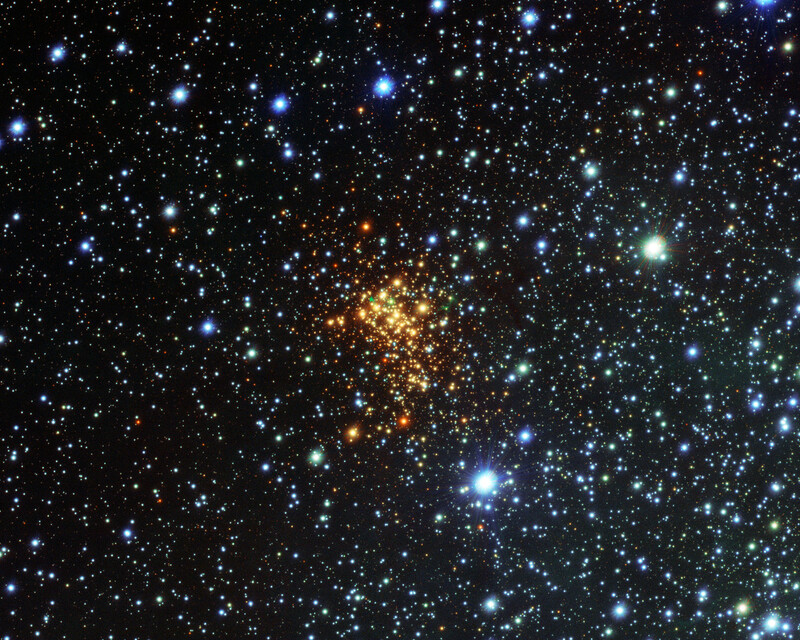 Now, astronomers studying images of Westerlund 1 from a new survey of the southern skies  have spotted something unexpected in this cluster. Around one of the stars — known as W26, a red supergiant and possibly the biggest star known— they have discovered clouds of glowing hydrogen gas, shown as green features in this new image. Such glowing clouds around massive stars are very rare, and are even rarer around a red supergiant— this is the first ionised nebula discovered around such a star. 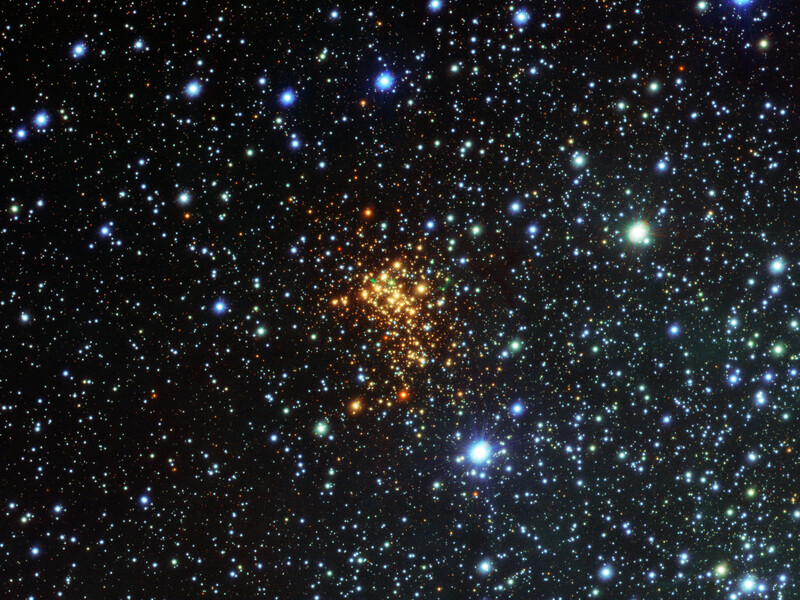 W26 itself would be too cool to make the gas glow; the astronomers speculate that the source of the ionising radiation may be either hot blue stars elsewhere in the cluster, or possibly a fainter, but much hotter, companion star to W26. W26 will eventually explode as a supernova. The nebula that surrounds it is very similar to the nebula surrounding SN1987A, the remnants of a star that went supernova in 1987 . SN1987A was the closest observed supernova to Earth since 1604, and as such it gave astronomers a chance to explore the properties of these explosions. Studying objects like this new nebula around W26 will help astronomers to understand the mass loss processes around these massive stars, which eventually lead to their explosive demise. This picture forms part of a detailed public survey of a large part of the Milky Way called VPHAS+ that is using the power of the VST to search for new objects such as young stars and planetary nebulae. A spectacular recent picture of the Prawn Nebula was made using observations from the same survey. This nebula is thought to have surrounded SN1987A’s progenitor star since before it went supernova. Position (Dec): -45° 50' 44.76"